DeepEX software can be used to simulate any deep excavation project model using several different support types. In this section we provide extended information on support systems, commonly used in shoring design. 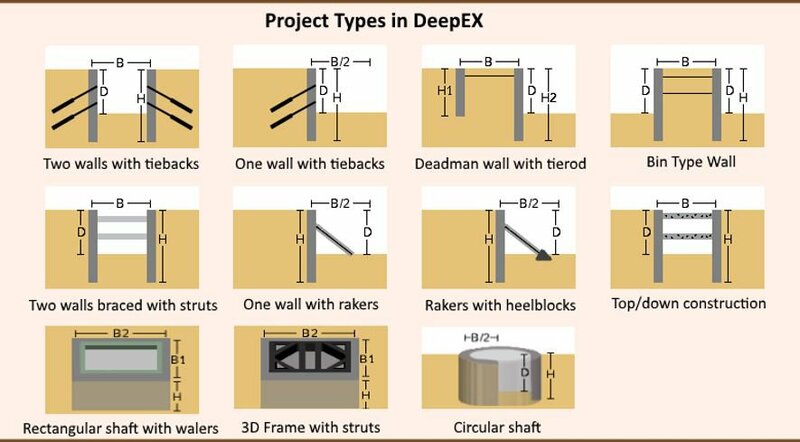 The following figure presents some project and support types that can be designed DeepEX. Below, you can find additional information on support systems like ground anchors, bracing (struts and rakers), top down excavation (concrete slabs) and more. Review information about use and installation methods of tiebacks and rock anchors. Review information about use and installation sequence of braced excavations/cross-lots. Review information about use and construction sequence of top/down excavations. Review advanced shoring design examples for various support and systems and wall types.